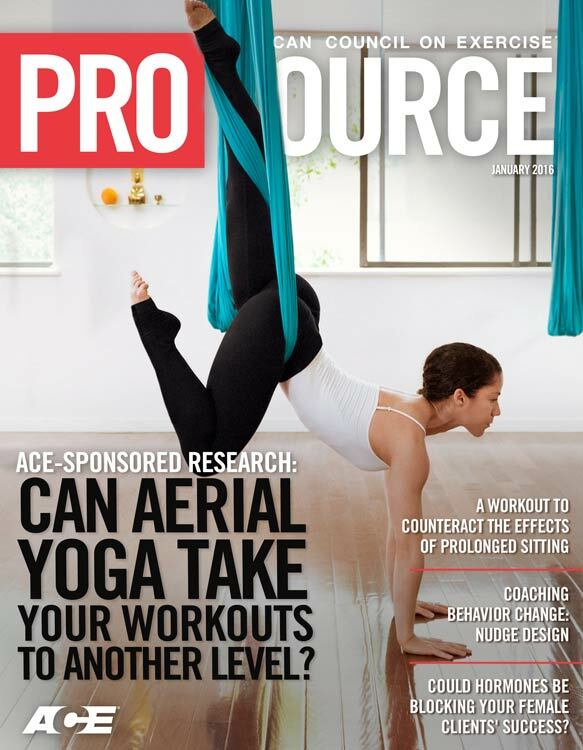 ACE - ProSource™: January 2016 - ACE-SPONSORED RESEARCH: Can Aerial Yoga Take Your Workouts to Another Level? 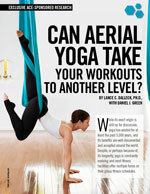 ACE-SPONSORED RESEARCH: Can Aerial Yoga Take Your Workouts to Another Level? While its exact origin is still up for discussion, yoga has existed for at least the past 5,000 years, and its benefits are well-documented and accepted around the world. Despite, or perhaps because of, its longevity, yoga is constantly evolving and most fitness facilities offer multiple forms on their group fitness schedules. Unnata also claims Aerial Yoga “offers authentic yoga, and works with gravity to relax and realign the body, center the mind and uplift the spirit.” But is an effective form of exercise? ACE enlisted the help of Lance Dalleck, Ph.D., at Western State Colorado University to find out. The purpose of this study was twofold. First, Dr. Dalleck aimed to quantify participants’ acute cardiovascular and metabolic responses to Aerial Yoga. Second, he wanted to determine the effectiveness of a six-week Aerial Yoga intervention at positively modifying cardiometabolic risk factors. Sixteen healthy women between the ages of 18 and 45 years old were recruited to participate in the study, which involved a six-week intervention with three 50-minute sessions per week (18 total). 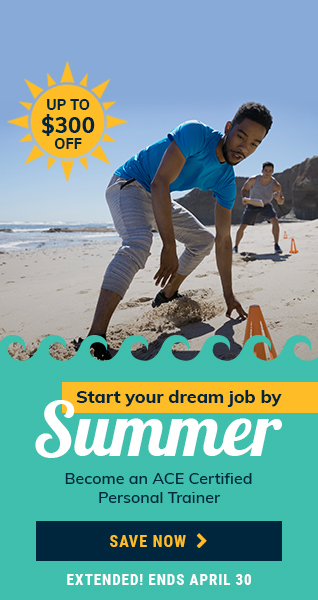 The same qualified instructor led all sessions and one make-up session was available each week. All of the participants were considered low-to-moderate risk and were defined as physically active per American College of Sports Medicine (ACSM) guidelines (ACSM, 2014). None of the women displayed any evidence of cardiovascular, pulmonary or metabolic disease. 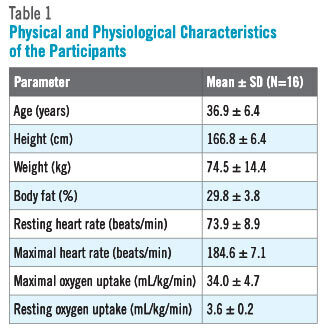 The physical and physiological characteristics of the participants are presented in Table 1. To quantify the acute responses to Aerial Yoga, each participant wore a calorimetric measurement system (to measure the breath-by-breath metabolic response to exercise) and a heart-rate monitor (to measure the cardiovascular response to exercise). 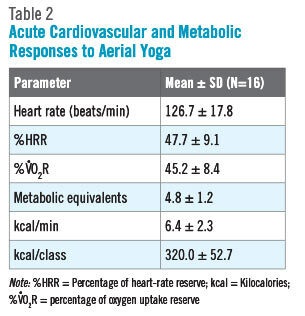 The acute responses to a single Aerial Yoga class are presented in Table 2. The results of this study indicate that participation in Aerial Yoga can be classified as moderate-intensity exercise. The participants exercised at workloads that elicited heart-rate reserve (HRR) (47.7 percent) and oxygen uptake reserve (VO2R) (45.2 percent) values that fall within the moderate-intensity category. Similarly, the metabolic equivalent (MET) response to the Aerial Yoga sessions (4.8 METs) falls squarely within the moderate-intensity range of 3 to 6 METs (Ainsworth et al., 2011; U.S. Department of Health and Human Services, 2008). This is an important finding, as moderate-intensity exercise has been proven to yield health benefits (ACSM, 2014; U.S. Department of Health and Human Services, 2008). Anecdotally, the participants reported that the intensity of the Aerial Yoga session fell somewhere near the midpoint on an intensity spectrum ranging from stress-relieving, restorative yoga sessions (at the low end) to high-intensity, hot yoga classes. It is also important to note that the MET values described by the participants compare favorably to other popular forms of exercise. For example, walking at 3.0 miles per hour is considered to be moderate-intensity activity, but at 3.3 METs, which falls at the low end of the range of 3 to 6 METs. Participation in a Zumba Gold exercise class elicits a moderate-intensity metabolic response of 4.3 METs (Dalleck et al., 2015). In addition, each 50-minute Aerial Yoga class yielded a mean energy expenditure of 320 kcal, which falls within industry recommendations for daily energy expenditure. For the sake of comparison, Zumba Gold classes burn approximately 200 kcal (Dalleck et al., 2015). The chronic cardiovascular and metabolic response to Aerial Yoga training for all measured cardiometabolic risk factors before and after the intervention are presented in Table 3. 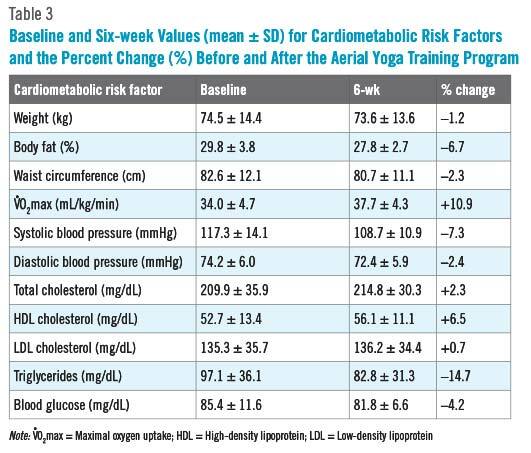 At the conclusion of the six-week Aerial Yoga program, there were significant (p < 0.05) improvements in the following cardiometabolic risk factors: weight, body-fat percentage, waist circumference, VO2max, systolic blood pressure and HDL cholesterol (highlighted in Table 3). No significant changes were seen in the other risk factors. The improvement in VO2max seen in this study (10.9 percent increase) is comparable to other aerobic-based training studies. Asikaienen et al. (2002) reported an improvement in VO2max of 9.5 percent among participants in a 24-week walking study, while Church and colleagues (2007) found an increase of 8.2 percent after six months of moderate-intensity walking or cycling. The 10.9 percent increase in VO2max measured in this Aerial Yoga study represents an important clinical finding, as the literature suggests that a 15 percent reduction in mortality is seen with a 10 percent improvement in VO2max (Dunn et al., 1999; Blair et al., 1995). The blood lipid changes seen in this study [i.e., a 3.4 mg/dL improvement in high-density lipoprotein (HDL) cholesterol and a 14.3 mg/dL reduction in triglycerides] are also comparable to those typically reported in the literature following aerobic-based exercise training. Durstine et al. (2001) reported that 15 to 20 miles per week of brisk walking or jogging was associated with a 2 to 3 mg/dL increase in HDL cholesterol and an 8 to 20 mg/dL reduction in triglycerides. Low HDL cholesterol values represent a strong modifiable and independent risk factor for cardiovascular disease (CVD) (Fuster et al., 1996). It has been estimated that for every 1 mg/dL increase in HDL cholesterol, the risk for a coronary heart disease (CHD) event is reduced by 3 percent in women (Paternak et al., 1990). The data derived from this Aerial Yoga study suggest that the participants reduced their risk for a CHD event by approximately 10 percent over the course of the six-week intervention. Finally, while the reductions in systolic blood pressure (–8.6 mmHg) and diastolic blood pressure (–1.8 mmHg) may seem modest, these training adaptations represent a positive impact on overall CVD risk. It has been demonstrated that blood pressure decreases of as little as 2 mmHg are associated with a 6 percent decrease in stroke mortality and a 4 percent decrease in coronary artery disease (Chobanian et al., 2003). According to Unnata’s website (www.aerialyoga.com), “Unnata Aerial Yoga is not recommended for individuals who have high blood pressure, cataracts, are pregnant, or anyone for whom hanging upside-down could cause medical complications or discomfort. Dr. Dalleck admits to being a bit surprised by the reduction in blood pressure experienced by the women in this study, especially given the fact that they all had normal blood pressure before the study began. He suggests that perhaps the participants found the Aerial Yoga to be helpful for relieving stress, and states that future research to study the effect of this type of exercise on stress levels and mood may be warranted. Overall, Dr. Dalleck found the physiological responses to Aerial Yoga to be a pleasant surprise. Remember, these sessions did not include a traditional cardiorespiratory-training element, so the improvements in VO2max and blood pressure are even more impressive. Stated simply, according to Dr. Dalleck, “Aerial Yoga proves to be a great alternative form of exercise with benefits in line with other, more popular forms of exercise.” It should the goal of any health and fitness professional, Dr. Dalleck reminds us, to find an effective mode of exercise that accommodates the needs of each individual client or participant, while also being enjoyable. Ainsworth, B.E. et al. (2011). Compendium of physical activities: A second update of codes and MET values. Medicine & Science in Sports & Exercise, 43, 8, 1575–1581. American College of Sports Medicine (2014). ACSM's Guidelines for Exercise Testing and Prescription (9th ed.). Philadelphia: Wolters Kluwer/Lippincott Williams & Wilkins. Asikainen, T-M. et al. (2002). Randomised, controlled walking trials in postmenopausal women: The minimum dose to improve aerobic fitness? British Journal of Sports Medicine, 36, 189–194. Blair, S.N. et al. (1995). Changes in physical fitness and all-cause mortality. Journal of the American Medical Association, 273, 1093–1098. Chobanian, A.V. et al. (2003). The Seventh Report of the Joint National Committee on Prevention, Detection, Evaluation, and Treatment of High Blood Pressure: The JNC 7 Report. Journal of the American Medical Association, 289, 2560–2572. Church, T.S. et al. (2007). Effects of different doses of physical activity on cardiorespiratory fitness among sedentary, overweight or obese postmenopausal women with elevated blood pressure: A randomized controlled trial. Journal of the American Medical Association, 297, 2081–2091. Dalleck, L.C. et al. (2015). The cardiovascular and metabolic responses to Zumba Gold in middle age and older adults. Journal of Sports Science and Medicine, In press. Dunn, A.L. et al. (1999). Comparison of lifestyle and structured interventions to increase physical activity and cardiorespiratory fitness: A randomized trial. Journal of the American Medical Association, 281, 327–334. Durstine, J.L. et al. (2001). Blood lipid and lipoprotein adaptations to exercise: A quantitative analysis. Sports Medicine, 31, 1033–1062. Fuster, V. et al. (1996). Pathogenesis of coronary disease: The biological role of risk factors. Journal of the American College of Cardiology, 27, 946–1047. Pasternak, R.C. et al. (1990). Spectrum of risk factors for CHD. Journal of the American College of Cardiology, 27, 964–1047. U.S. Department of Health and Human Services (2008). Physical Activity Guidelines for Americans. www.health.gov/paguidelines/pdf/paguide.pdf. 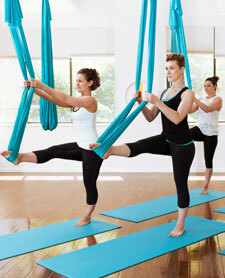 The results of this study indicate that participation in Aerial Yoga can be classified as ___________ exercise. A 50-minute Aerial Yoga class burns approximately ______ kcal, which falls within industry recommendations for daily energy expenditure. The data derived from this Aerial Yoga study suggest that the participants reduced their risk for a CHD event by approximately_____ percent over the course of the six-week intervention. Although the reductions in blood pressure experienced by participants were modest, it has been demonstrated that blood pressure decreases of as little as ____ mmHg are associated with a 6 percent decrease in stroke mortality and a 4 percent decrease in coronary artery disease.